Withy Mead Nature Reserve is owned by the Ann Carpmael Trust and Sonning Common Green Gym has been working there on a monthly basis since the Reserve’s earliest days in the spring of 2005. Situated on the bank of the Thames in Goring, this scenic 22-acre Reserve is noted for its swathes of rare Loddon lily and its many species of passing and breeding birds. Part woodland and part reed bed, the site is threaded by water inlets which were used until the 1930s by Saunders boat builders. The slipway was dug out by Sonning Common Green Gym to reveal rails and pulleys, and vestiges of this industry still remain among the trees. 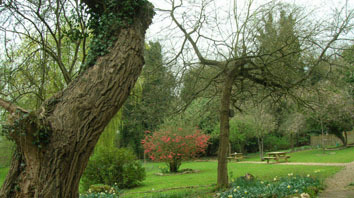 Visit the Reserve’s website www.withymead.org for more information. Sonning Common Green Gym carries out a great variety of tasks under the direction of Reserve Warden Brian Shaw: building boardwalks and bridges in the reed bed, cutting back overgrown willow on the river bank, clearing fallen trees and minor tree felling, building a fence and shelter for the Forest School (a programme for pre-schoolers), pond clearance, removing industrial debris for site safety, and many more. This is one of our favourite sites. There is an area for parking opposite the Reserve entrance, which is reached via the road signposted Goring Thames Sailing Club off the B4009.